Star Wars fans need to check this out. 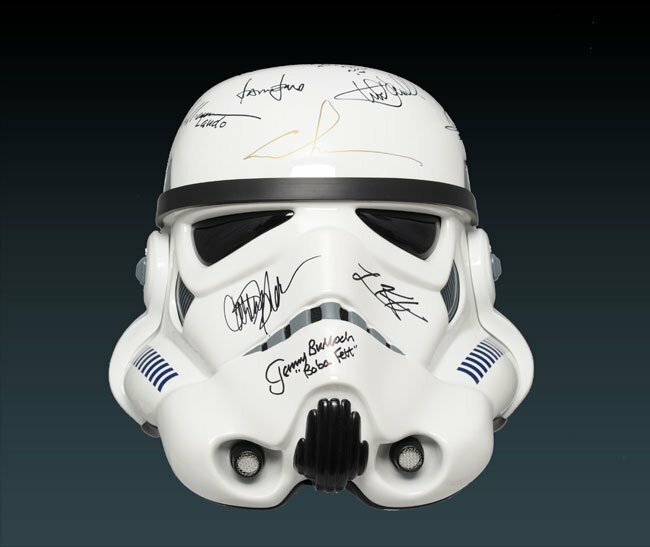 A company called eFX Inc is running an auction to benefit the Make a Wish Foundation for a replica Storm Trooper Helmet that has signatures for the cast of the original Star Wars flick A New Hope on it. The helmet is up for auction and has traveled a total of 25,000 miles as it went around the world getting signatures from the cast. Among those that signed the helmet are George Lucas; actors Mark Hamill, Harrison Ford, Carrie Fisher, David Prowse, James Earl Jones, Frank Oz, Peter Mayhew, Anthony Daniels, Kenny Baker, Billy Dee Williams, Jeremy Bulloch and Warwick Davis along with several others. The helmet is even signed by the late Irvin Kershner as well. The helmet is really cool and any fan with the means to purchase it will have a cool collectible and help a very good charitable organization as well. “The helmet traveled more than 25,000 miles – from Southern California to Skywalker Ranch to London and New York and many places in between to be signed, and it’s an amazing sight to behold,” said Bryan Ono, president of eFX Inc., who spearheaded the efforts to collect the autographs. The eBay big is already up to $7,600!